A/C, Short Walk to the beach! Family/pet friendly. 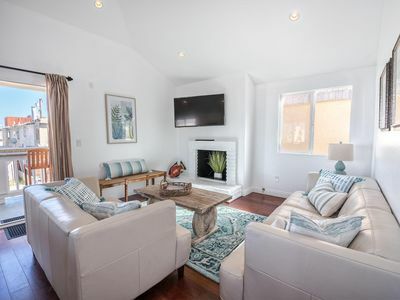 Bright and breezy, and just steps to PCH and the sand! Best location in Huntington Beach. No driving needed! 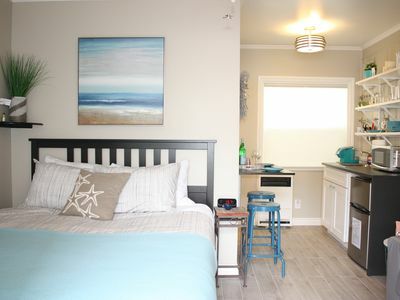 This is the perfect beach apartment to enjoy your vacation with a small family or friends. 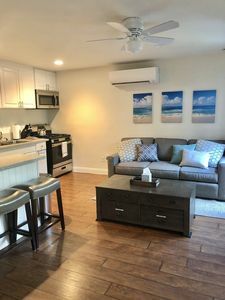 Just steps to the shore, everything is within walking distance - beach, dog beach, pier, sight seeing, shopping, restaurants, surf museum, bar and fun nightlife. 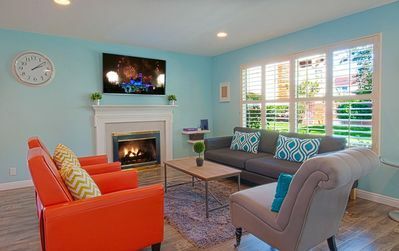 Recently remodeled, everything is NEW! Comfortably sleeps 4 plus! 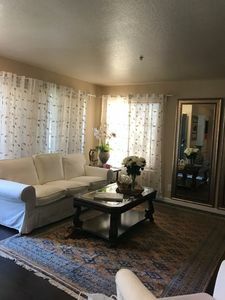 - with 1 queen bed (sleeps 2) in the bedroom and 1 queen sleeper (sleeps 2) in the living room, plus 1 twin fold out bed and a portable crib for little ones. 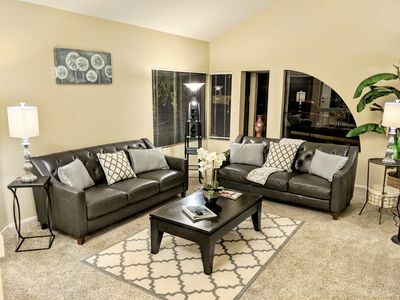 This modern yet casual-style apartment features two LCD flat screen TVs, free high-speed wifi, stainless steel appliances, stone tile and wood floors throughout. 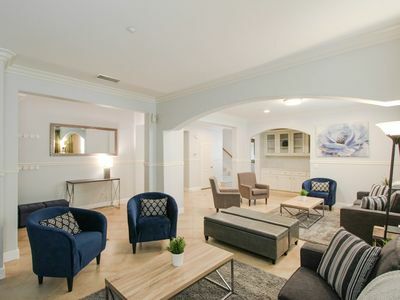 This single story, first-floor apartment is outfitted with the highest quality designer furniture, luxury linens and access to the onsite laundry room with commercial-sized washers and dryers. 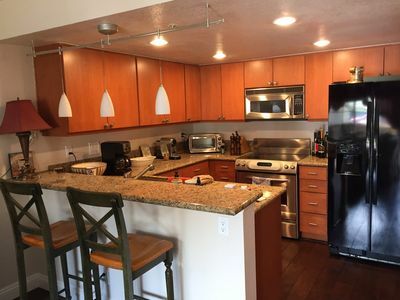 Our open-layout kitchen comes fully equipped with everything you will need for cooking full-sized family meals, and our amenities will be sure to make your visit a vacation to remember including: high speed wireless internet, cable, blue-ray DVD players and outdoor dining with BBQ grill and patio dining furniture. 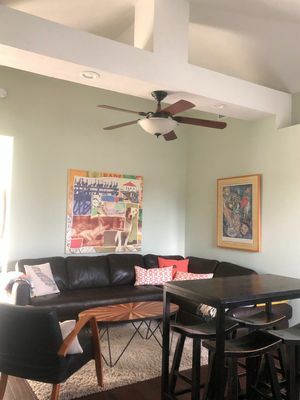 This apartment home contains everything you'll want for a relaxing day at the beach including: boogie-boards, beach towels, chairs, umbrella, wagon, sand toys, cooler, two beach cruisers, and 1 kids' bike. At ground level (no stairs to climb! 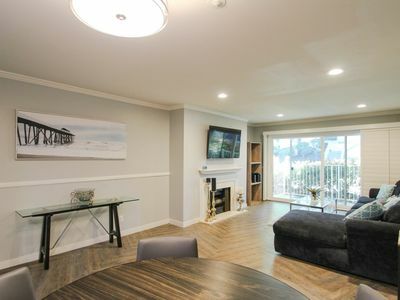 ), this apartment home features a living room and open kitchen area with island dining space for 4 adults plus high-chair (included), as well as an over-sized slider with door that opens to a patio perfect for that cold drink after a day at the beach. The kitchen contains everything you'll need for making family meals and memories . It is equipped with stainless steel appliances which include a refrigerator, gas burners with oven, and solid-surface countertops. 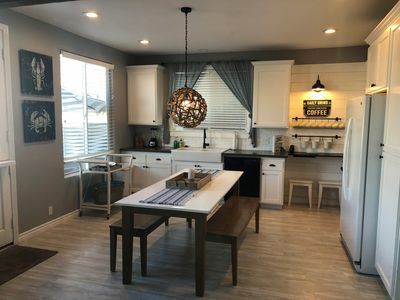 Additionally, this kitchen has been well stocked with an assortment of spices, herbs, condiments, cooking appliances, and any dish or accessory that you might need to create that memorable meal. 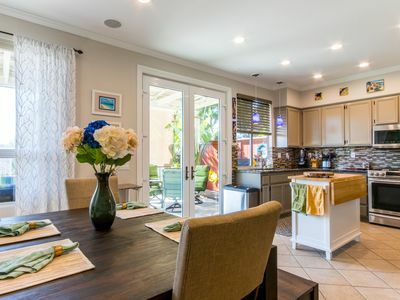 The custom island counter is perfect for kitchen dining and opens into the family room with its own flat screen LCD TV, making it cozy enough for watching the kids or having conversation with family, all while cooking and enjoying the ocean breeze. Just off the living area is our private patio with furniture, allowing for even more space for dining and relaxing after a day at the beach. 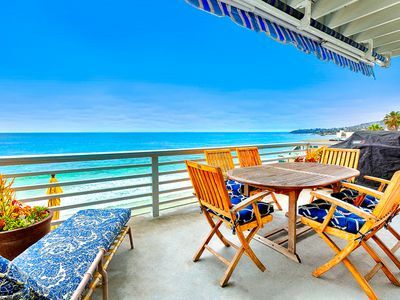 You can hear the waves crashing, step out and see the fireworks display from Disneyland, or enjoy the cool ocean breezes while lounging in the private patio area. 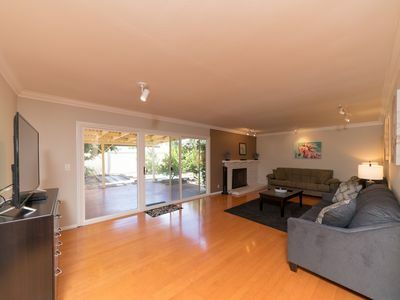 Off of the living room is the spacious bedroom and bathroom. 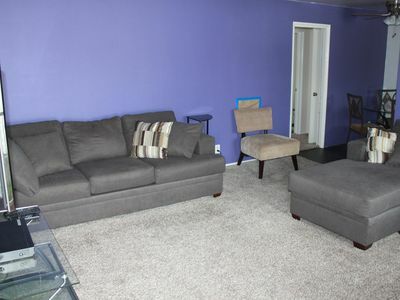 The large bedroom includes a plush pillow-top queen sized-bed, plus room for the crib or pull-out twin. A tranquil room with a full sized-closet and dresser, the bedroom also has a flat screen TV and private access to the bathroom. The bathroom has a stand alone shower with a modern rain head shower nozzle perfect for relaxing after a long day at the beach. We are conveniently located for access to all major theme parks with Disneyland and Knott’s Berry Farm both being only 20-25 minutes away. LegoLand, San Diego Zoo and SeaWorld are approx. 60 to 75 minutes. Of course, the beach itself is the star attraction with its 15-mile long oceanfront boardwalk for biking, rollerblading and skateboarding. For beginning surfers, there is the world famous Corky Carroll’s Surf School. Activities abound on the beach including free outdoor concerts every Sunday during peak season, and professional sporting events throughout the year including the U.S. Open of Surfing, AVP Pro Beach Volleyball and the Surf City USA Marathon. 30 minutes to Angels Anaheim Stadium and Anaheim Ducks Arena for professional ball games and concerts. 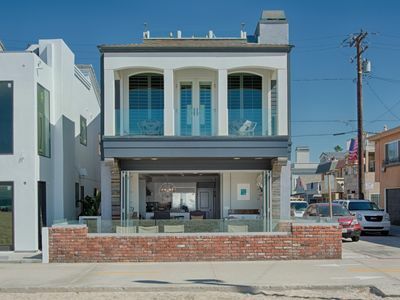 60 minutes to shop or celebrity watch in Beverly Hills, Santa Monica Beach, Venice Beach and Hollywood. For more laid back activities there are more than 600 concrete fire rings for beach barbecues or a romantic evening in the cool night air. 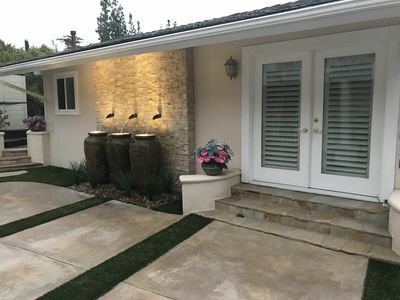 This property is conveniently located near John Wayne/Orange County Airport (SNA) 20 minutes, Long Beach Airport (LGB) 25 minutes, Los Angeles International (LAX) 45 minutes and Ontario International Airport (ONT) 50 minutes. 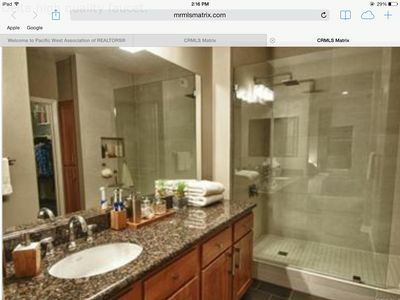 If you have any questions about this property please contact us. Fantastic 3 Bed Home, walk to shopping, Great Value ! Elegant Beach Front Home –Where life long memories are made! Book your Spring get away today! 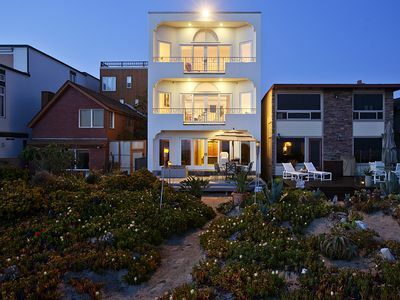 Spacious Oceanfront Single Family Home Located on the Boardwalk 1/2 Mile to the Newport Pier! Ultimate Disney Grand Opening Special W/GAME ROOM!